Today we have a guest post from an Edinburgh based playwright Hope Estella Whitmore, writing about autistic experience. Hope’s current project started after she was given the opportunity to work with Graeae, a theatre company specializing in ‘breaking down barriers, challenging preconceptions, and boldly placing disabled artists centre stage. Last year I was lucky enough to take part in Graeae’s Play Labs project. Graeae is a UK-based theatre company with an aesthetic of access for people with disabilities. As part of this agenda they run an annual project called Play Labs. Play Labs offer playwrights a chance to conduct research into a chosen element of disability in a safe environment, whilst being offered support by Graeae. For me Play Labs was a chance to conduct research into autism, exploring common perceptions and looking at the reality of being on the ‘passing’ end of the spectrum, treading a tightrope between being autistic and neurotypical. Autism is frequently not a simple or visible condition. I wanted to create a body of work that showed the complexity of autism, both in terms ofthe experience of being autistic, and with reference to other people’s experience of coping with and understanding those who are autistic. I decided to focus my script on the individuality and depth of an autistic child’s imagination. Graeae gave me funding and support to work with this idea. I also had the chance to speak to neurologists, parents of children with autism and people on the spectrum. The resources and support that Graeae gave me, together with the support of my mentor, Carissa, were invaluable during this process and helped me create a body of work. One of the most useful aspects of this support was the ability to attend workshops designed to assist the writing process. These workshops explored the relationship between disability and theatre. Most interesting was an Open Access Workshop I took in December with other Play Labs participants. I didn’t know what to expect, and when I was told the workshop was about ‘opening up access to theatre for those with disabilities’ I imagined it was probably going to involve talks about Health and Safety, and spaces for wheelchairs. I didn’t realise what a massive topic Open Access was. When I arrived late, having got lost among the converted warehouses of Hackney, I was invited to join the group, and Amit, who was running the workshop, began by telling us we all had a sign name. The interesting thing about sign names is that they grow organically from you as a person. They are not made up of letters of the sign alphabet; they are a gesture that encapsulates you. At first you are allowed to choose your own sign name but it can change if one of your friends or colleagues identifies a gesture which is very ‘you’, which can then become your sign name. The creativity of this naming has a beauty to it, and the creation of our own sign names was a great introduction to the workshop. We had to choose a sign name, and then explain the gesture to the others in the group not demonstrating with our hands until they were able to make the sign perfectly. My sign name is as follows: put both arms out directly in front of you; cup your hands together; open your arms and spread your hands as though letting go of a small bird. We then continued the workshop by exploring what disability is, and our perceptions of the role it plays in theatre. Something I found inspiring was the way in which Graeae’s scriptwriters seek creative ways to integrate disability into every script without making it the focal point. For example, they produced a play about a small boy who imagines conversation with his absent father by describing everything he sees and does. This gives people with visual impairments an indication of what is happening on stage, but is done in a way which stems organically from the story and improves the piece for everyone. It is too easy for those without disabilities to believe that access is somehow ‘politically correct mumbo-jumbo,’ but this could not be further from the truth. Amit recounted one story of a production where a Graeae staff member stood up and asked all the audience if any of them had bought their own light bulb. When they said no, she flicked off all the lights in the auditorium. Then she asked them all to stand up if they hadn’t bought their own chairs. I think she made her point succinctly: we all have needs, and we take it for granted that those needs will be met. People with disabilities, on the other hand, frequently have to fight for their needs to be met in theatre and in other areas of life. The workshop brought home the importance of wheelchair access, of dialogue screens for Deaf or hard of hearing, and of headsets -audio description – explaining what is happening on stage for people with visual impairments. Yet it also demonstrated the potential for creativity, play, and finding new and exciting ways to create an environment that enabled those with disabilities to have a full theatrical experience. I love the idea that widening access can involve giving a piece of writing extra depth, rather than adding access features, such as audio description as an afterthought. Graeae has a whole library of scripts that integrate access into their plays, and I would love to read these. My aim is to ? learn how to write theatre that is accessible for people with different disabilities, and I hope that my current project will reflect Graeae’s mission statement in some way: to break down barriers, challenge perceptions and place disabled artists centre stage. The Play Lab programme currently runs on an annual basis, with applications due in July, and the Play Labs taking place in September and October – see (http://www.graeae.org/news/playlabs-programme-returns/ for more details. Here are some thoughts on images and disability. One of our tasks in setting up DSN is to decide which visual images of disability we would like to appear on the blog. More broadly, we would like to discuss, interrogate and expand the range of cultural images of disability. My interest in this project is both academic and personal. I have two disabilities, one visible (cerebral palsy) and one invisible (a visual impairment). My PhD project considers visual impairment/partial sight as an aesthetic in poetry and examines how a collection of poems can reflect this aesthetic. As such, I have a strong interest in how people with disabilities are seen and in how they see themselves. Which images of disability are widely available in society? How do these images reflect and reinforce attitudes towards disability, and, where applicable, how can we present a more nuanced view of physical, sensory or cognitive difference? Let’s start with visual images and signs. When I Googled ‘images of disability’ in order to write this (admittedly not a very thorough research method), I mostly found reproductions of the figure-­‐in-­‐a-­‐wheelchair silhouette familiar from car parks and accessible toilets. The silhouette has its uses. It is familiar and instantly recognizable (at least to the sighted community). It marks off areas for the exclusive use of people with disabilities (although sometimes with limited success). But it also has its drawbacks. It is not an especially detailed image. We know that the people concerned have disabilities, but we don’t know much else about them. The image suggests that all disabled people use wheelchairs – not true. More disturbingly, it also suggests that disability is always the dominant factor in the lives of people with disabilities. Perhaps it’s silly to complain about the silhouette. It is, after all useful. It doesn’t sum up the entire cultural history of disability. Complaining about it is like saying that the equivalent gender symbols are inadequate because not all women wear skirts and not all men wear suits. Moreover, until the day when architectural barriers vanish because all public facilities are accessible (something which would radically change the concept of disability) we do need a symbol to designate accessible areas. However, given the multiplicity of disparate conditions and experiences contained within ‘disability’ a broader range of symbols would be appropriate. These do sometimes appear. 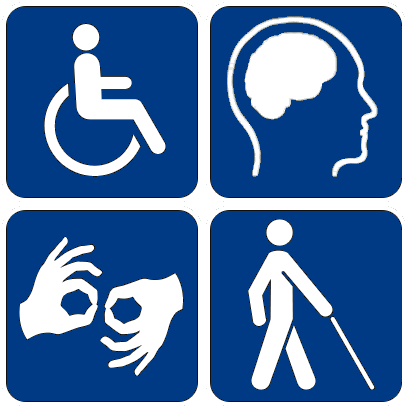 During my search I found a group of images from Disability Studies Quarterly that included the wheelchair image together with images of ears, eyes, a person using a stick, etc. A similar image is reproduced above. It would be good to see this broad range of images more often in public spaces. It would also be good to see more nuanced cultural representations of disability. The relative lack of such representations is puzzling given how common disability is. One in 10 of the world’s population is disabled. Moreover, almost everyone will become disabled if they live long enough – unlike some minorities disability has an open door policy. You can join at any time. Some disability activists, with questionable taste, refer to the non-­‐disabled population as TABs, (Temporarily Able-­‐Bodied). One of the likely side effects of an ageing population is a boom in age-­‐related disability. This may make us question the value of a disabled/non-­‐disabled binary. Neither term makes sense without the other, but both are more porous than they may at first appear. Arguably it makes more sense to think of ability as variable in different situations, rather than as part of an unchanging opposition. Our society’s view of youth, independence and individual achievement as desirable attributes makes disability, the club we will all join, a frightening prospect for many people, even though it is a natural part of life, and especially of old age. This societal anxiety often leads to negative representations of disability, which is seen as an overwhelming loss of agency, worth and personality. Disabled characters in literature often have little to distinguish them other than their disability. They are versions of the wheelchair silhouette – their disability is so overdetermined as to blot out all other features. Since I was a book-­‐obsessed adolescent I spent many years looking for my life in literature. I rarely found it. There were plenty of disabled figures, but they were shadowy and disturbing. Either they were deformed by bitterness, like Captain Hook or Richard III, or they were pathetic creatures like Tiny Tim. Worse still, they had a horrible habit of getting better. I retain a poisonous dislike of Heidi and The Secret Garden, improving narratives in which invalids learn to walk through the good offices of able-­‐bodied girls. These books are the descendants of mythical and Biblical narratives in which heroes such as Perseus or Christ vanquish deformity. How could I identify with my image, if all the fictional people like me kept disappearing, transformed by the powers that were into acceptable members of society? One of the reasons I’m not a Christian is that I feel there’s no space for me in a tradition where bodies like mine disappear. I understand that everyone’s body disappears – that’s the point – but still the implication that disability is a problem solved by Christ, rather than a valuable aspect of life makes me uneasy. Disappearing disabilities are not so common now, but literary images of disability are still quite restrictive. I was inspired to begin my PhD project when I read a poem called ‘Blind’ by Edwin Morgan, from his collection Cathures (Carcanet, 2002). There is nothing technically wrong with this poem. It is about a blind singer, and its iambic tetrameter lines do sing. But I find its perspective difficult to accept. is that voice in the city street. That was written only ten years ago, but it tallies with traditional images of disability, distorting blindness, turning the blind woman – who for all we know may be thinking of her lunch – into a prop in the non-­disabled writer’s drama. It also propagates clichés associated with blindness. There is no ‘country of the blind’. Blind people are not automatically lonely, nor are they angels of fortitude. They are people, not metaphors. The preponderance of such distorted cultural images has unfortunate effects on real people with disabilities. I frequently attend writing courses to develop my poetry. The last time I did this I explained to one of the other writers that I was partially sighted. She said ‘But you can read’. From her tone of voice, she could have been saying ‘But you can fly’. I have had exactly the same conversation with a hospital consultant doing ward rounds, who, given his medical training, really should have known better. But the picture of people with disabilities as completely helpless is so prevalent that it can distort relations between real people, making it unbelievable that I, a partially sighted woman should be able to read print. This is not to say that I haven’t on occasion come across wonderful portrayals of disability in literature. I warmly recommend Nights At The Circus by Angela Carter to absolutely everybody who hasn’t read it. It focuses on Fevvers, an aerialiste who may or may not be a freak of nature, a winged woman. It is usually read as a feminist text, but its portrayal of the social and psychological effects of having a visibly different body, and of the balancing act between constraint and freedom that this entails makes it an important text for disability studies. Nevertheless, nuanced representations of disability as one aspect of a rounded life are rare. Given the prevalence of disability this seems ridiculous. It is why I want to write poems that present people with disabilities as people, not disabilities. I sometimes worry that in focusing on visual impairment I am recreating the tendency to turn disabled people into spectacles for a sighted, non-­‐disabled audience. For this reason I am planning to produce my poems in Braille and audio as well as print. There seems little point in writing about visual impairment in a medium solely available to sighted readers. Living between sight and blindness I want to question cultural links between vision and knowledge, vision and artistic talent, vision and worth. I want to question how we see disabilities and the people who live with them. Being someone else’s metaphor is tiring, and distorts my experience and that of other people who live with disabilities. I don’t want to appear as a monster or an angel of fortitude. I want to appear as a person.